Researchers at the University of California, San Diego Jacobs School of Engineering have developed a technique that enables metallic nanocrystals to self-assemble into larger, complex materials for next-generation antennas and lenses. The metal nanocrystals are cube-shaped and, like bricks or Tetris blocks, spontaneously organize themselves into larger-scale structures with precise orientations relative to one another. 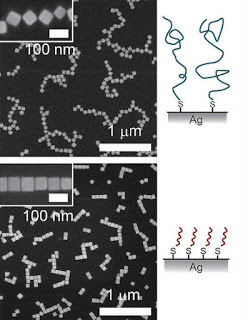 Their findings were published online June 10 in the journal Nature Nanotechnology. This research is in the new field of nanoplasmonics, where researchers are developing materials that can manipulate light using structures that are smaller than the wavelength of light itself. The nanocubes used in this study were less than 0.1 microns; by comparison, the breadth of a human hair is 100 microns. Precise orientation is necessary so that the cubes can confine light (for a nanoscale antenna) or focus light (for a nanoscale lens) at different wavelengths. "Our findings could have important implications in developing new optical chemical and biological sensors, where light interacts with molecules, and in optical circuitry, where light can be used to deliver information," said Andrea Tao, a professor in the Department of NanoEngineering at the Jacobs School. Tao collaborated with nanoengineering professor Gaurav Arya and post-doctoral researcher Bo Gao. To construct objects like antennas and lenses, Tao's team is using chemically synthesized metal nanocrystals. The nanocrystals can be synthesized into different shapes to build these structures; in this study, Tao's team created tiny cubes composed of crystalline silver that can confine light when organized into multi-particle groupings. Confining light into ultra-small volumes could allow optical sensors that are extremely sensitive and that could allow researchers to monitor how a single molecule moves, reacts, and changes with time. To control how the cubes organize, Tao and her colleagues developed a method to graft polymer chains to the silver cube surfaces that modify how the cubes interact with each other. Normally when objects like cubes stack, they pack side-by-side like Tetris blocks. Using simulations, Tao's team predicted that placing short polymer chains on the cube surface would cause them to stack normally, while placing long polymer chains would cause the cubes to stack edge-to-edge. The approach is simple, robust, and versatile. In demonstrating their technique, the researchers created macroscopic films of nanocubes with these two different orientations and showed that the films reflected and transmitted different wavelengths of light. The research was supported by the National Science Foundation, the Hellman Foundation, and Jacobs School of Engineering at UC San Diego.